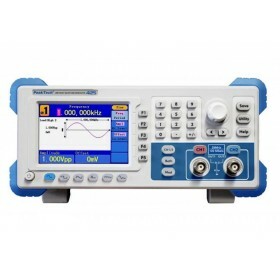 Direct Digital Synthesis (DDS) Function Generator, 10 µHz - 3 MHz, 1 Channel, 8 bits Vertical This instrument is the most versatile signal source used as 3 MHz direct digital synthesis (DDS) sweep function generator and pulse generator, offering a wide range of applications in both analog and digital electronics such as education, servicing, manufacturing and engineering. 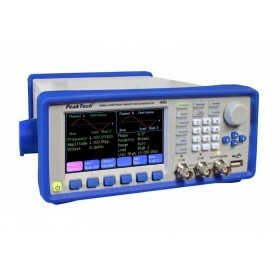 DDS Arbitrary Waveform Generator, 1 µHz - 5 MHz, 1 Channel, 14 bits Vertical This newly designed direct digital synthesis (DDS) arbitrary waveform generator with advanced graphical user control has excellent technical properties and a high variety of functions. 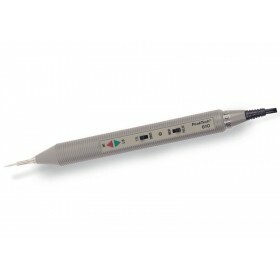 Of particular note here are the easily control via the various menu functions, a wide range of integrated waveforms and the excellent price/performance ratio. In this way this generator is perfect for almost all tasks in education, research and development. DDS Function Generator, 10 µHz - 20 MHz, 1 Channel, 8 bits Vertical This instrument is the most versatile signal source used as direct digital synthesis (DDS) sweep function generator and pulse generator, offering a wide range of applications in both analog and digital electronics such as education, servicing, manufacturing and engineering. DDS Arbitrary Waveform Generator, 1 µHz - 25 MHz, 2 Channels, 14 bits Vertical This newly designed direct digital synthesis (DDS) arbitrary waveform generator with advanced graphical user control has excellent technical properties and a high variety of functions. Of particular note here are the two equivalent output channels, the large number of pre-stored arbitrary waveforms and many different types of modulation. In this way, this device is perfectly suited for nearly all tasks in research, development and the training area. DDS Arbitrary Waveform Generator, 1 µHz - 60 MHz, 2 Channels, 14 bits Vertical This newly designed direct digital synthesis (DDS) arbitrary waveform generator with advanced graphical user control has excellent technical properties and a high variety of functions. Of particular note here are the two equivalent output channels, the large number of pre-stored arbitrary waveforms and many different types of modulation. In this way, this device is perfectly suited for nearly all tasks in research, development and the training area. 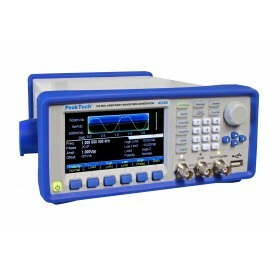 DDS Arbitrary Waveform Generator, 1 µHz - 30 MHz, 2 Channels, 14 bits Vertical This newly developed high-quality direct digital synthesis (DDS) arbitrary waveform generator has excellent technical properties and a high variety of functions. Of particular note here are the two equivalent output channels, the large number of pre-stored arbitrary waveforms and many different types of modulation. In this way, this device is perfectly suited for nearly all tasks in research, development and the training area. DDS Arbitrary Waveform Generator, 1 µHz - 60 MHz, 2 Channels, 14 bits Vertical This newly developed high-quality direct digital synthesis (DDS) arbitrary waveform generator has excellent technical properties and a high variety of functions. Of particular note here are the two equivalent output channels, the large number of pre-stored arbitrary waveforms and many different types of modulation. 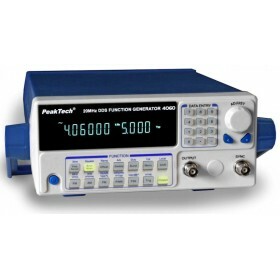 In this way, this device is perfectly suited for nearly all tasks in research, development and the training area. 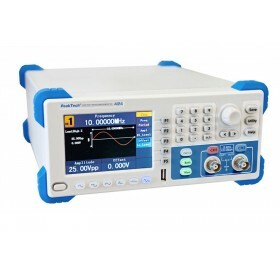 DDS Arbitrary Function Generator, 1 μHz - 160 MHz, 2 Channels, 14 bits Vertical Resolution, 500 MSa This newly developed high-performance arbitrary waveform generator has excellent technical characteristics and a wide range of functions at a high output frequency of up to 160 MHz. Of particular note here are the two equivalent output channels, the large number of stored arbitrary waveforms and the many types of modulation. The waveform is graphically displayed in the color TFT display, which shows the selected item with guidelines, such as Frequency setting, period, amplitude, offset, polarity, phase shift angle and the different modulation types.